Discussion in 'Parts, Maintenance & Servicing' started by MercedesEnthusiast, Feb 11, 2019. I'm a bit concerned with my MPG. 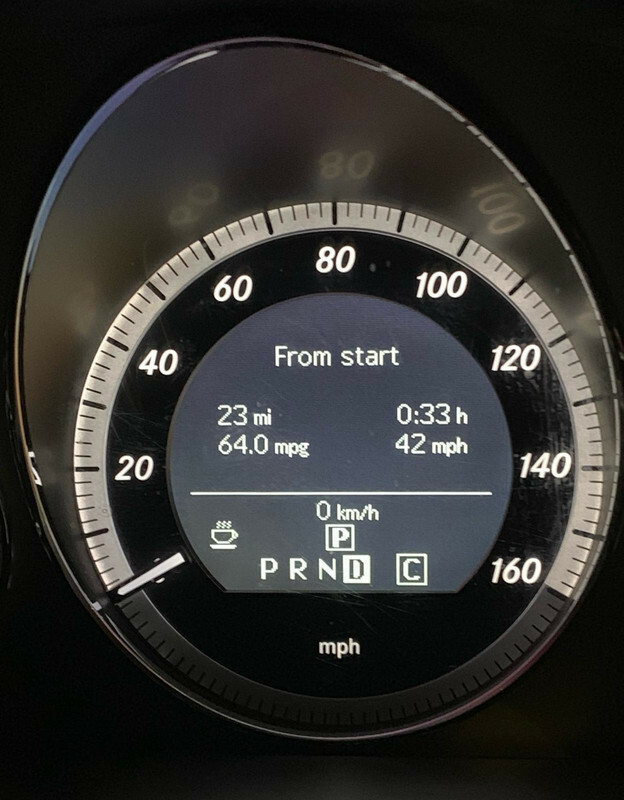 I have a W212 late 2012 and can't believe the MPG I get, in slow moving traffic it's returning about 17MPG and on long journey on motorway the best I got was 37MPG and didn't even put the foot down. I do believe something isn't right but I would appreciate if anyone can tell how much they get out of their w212. What kind of speed do you do? In my c250 if I go 80 I get 42ish mpg and that’s on a run, 70 gets 55mpg easily. I had the E350 S212 estate, and I used to get 26mpg in traffic coming out of London, averaged 30mpg and would see 36mpg on the motorway (could nudge 40mpg if sat at 70mph). Depends what slow moving traffic is? Everytime you are sat still you're doing 0mpg, so if you are sat at lights etc. a lot you could drop to 17mpg I suppose. Is your car getting to 90ºc quickly and sticking there no matter what you do? Mostly speed limit but sometimes a lot of traffic. For instance about 2 hours ago I just went out on a 5 mile journey including return home on a very heavy traffic and returned 17MPG which seems extremely excessive. I could barely get 10 MPH but the MPG seems really poor. Just realised you have a 250 cdi. Mine was the 3.5 litre petrol. How many miles do you do when sat in traffic? So how long did it take you to do 5 miles? If it is taking 30-40 minutes then 17mpg sounds perfectly believable, if a little annoying. 5 miles is not really enough for a diesel to get up to temperature, but should get there within 20 minutes even in traffic. If your thermostats are not working properly the car will think it is cold and over fuel. You need to test them before doing anything else. Yes, my car goes to 90 degrees quickly and remains there. But on a full tank, I'm not even doing 400 miles, roughly 360 - 370 which doesn't seem right to me. I was thinking if there's an issue as my rev has a little play, 100 RPMs up and down but seen lots of W212 with speedy RMP. My car gets to 90 in roughly 5 mins and the thermostats have been changed, been plugged into star and no errors at all. My E250 doesn’t get to 90 that quick can take it 15mins before it gets that hot. 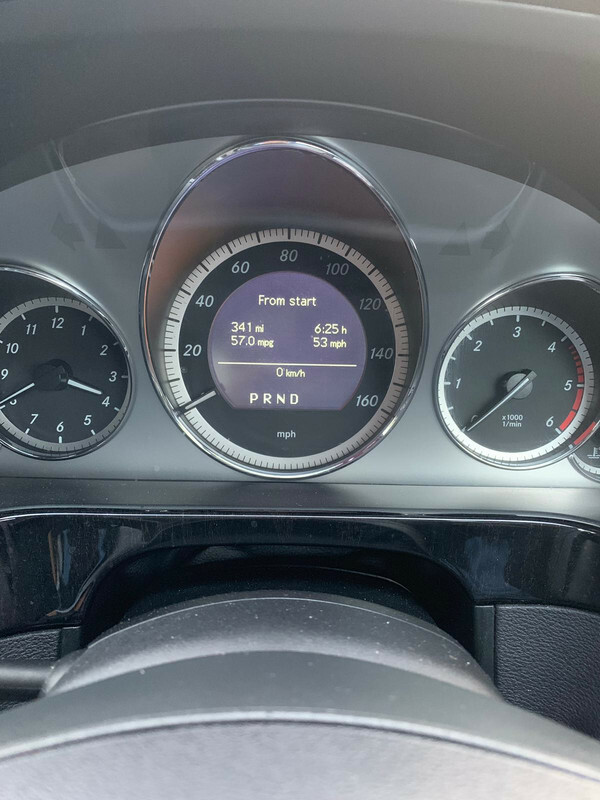 I do a 50 mile commute A roads and motorway anything between 48-60mpg depends on the right foot and sitting around 65-68mph on motorway makes a big difference. Driving round town does knock it down though think I’m half way through a tank and I reset trip when I filled it and it’s around 48mpg at moment I can get 500-550 before fuel light comes on. Something is wrong, my E250 gets 53-58mpg on average motorway/a-road and some town. I have got 64mpg through 50mph roadworks. Wow, nice figures. I'm getting more worried now. You do 500 - 550 before light comes on and I do 300 before my light gets on. What might be wrong? I wouldn’t know to be honest. When was it last serviced and by whom? Any smell of burning from the brakes at all when you stop? Probably nothing is wrong if thermostat is changed, brakes are not sticking and Star showed no faults. You can’t compare stop-start traffic with driving on a motorway or A-B roads. If it takes you let’s say 45-60 minutes for 5 miles 17mpg is to be expected. Is that 17mpg calculated on a tank to tank refill? Or from the onboard dash display which is notoriously rubbish. It's from the display but I know how many miles I do with a full tank. Please check the attachment and you can see where my fuel gauge is and how much it reckons I do with the remaining fuel. It seems excessive. You have traveled 3 miles in 51 minutes with average speed of 4mph, of course you will have such high fuel consumtion. MikeInWimbledon, clk320x and Greenmanslk like this. If you were doing 30mpg, the speed limit, it would take you 6 minutes. That means out of you 51 minute journey you are sat for 45 minutes doing 0mpg. This is obviously going to ruin your average. 14mpg and 3 miles per 50 minutes means you are getting to spend 4 1/2 hours in your car per gallon, I only manage around 15 minutes in mine for a gallon. So if you think of it as cost per minute you are doing far better than most of us. This is mine on motorway and a-roads, with a small amount of town driving too.